Here’s what I am doing w/ my team — it comes from a bias against infrequent (e.g. monthly) big meetings. First of all, I meet with my direct reports individually every week — depending on the individual it’s usually 15 minutes to 1 hour. I view these as my most important meetings. Format is the same every week — I ask them to bring me a list of things they want to talk about. Ideally the list includes things like blockers to their work they’re facing that they want to think through with me, any opportunities they’d like to pursue, questions about things they don’t understand or want to discuss in the marketplace or the organization etc. I ask them specifically not to view these 1:1s as status reporting meetings. You will see below why I don’t really need them to do that. I always bring my list of things to cover w them too — but almost never get to it since usually theirs and mine overlap. We almost always end early and never go late. Every morning we have our daily standup from 8:45 am – 9 am. It follows a pattern semi-borrowed from Scrum software development — everyone says a highlight or two from what they got done yesterday, mentions who they will meet with today and also what they have to get out the door that day. Just those three things and nothing more. Attendance is on a best-effort basis, but the expectation is that we all come every day. If you can’t make it, you just ask a buddy to “read out” for you. Send a couple bullets! We end with PSAs from whomever has one and then I read the word of the day from Wordthink.com. I am, afterall, a wordnerd. Intention here is to create situational awareness and avoid any duplicative efforts. Also this mtg functions to highlight any blockers people are hitting. Oh, and I had the facilities team remove the rectangle table from our team meeting room and replace it with a round table — we literally stand up during the meeting. 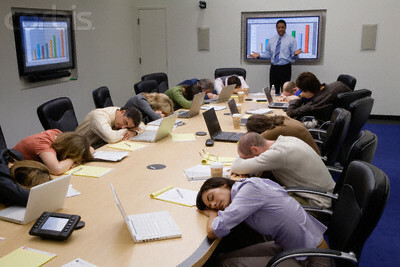 Every Tuesday we have a one hour team meeting. * We start with me listing off the three or four things that I am really excited about from the past wk. I namecheck anyone who has worked on these things and I try to be generous with compliments. I point out where we’ve collaborated well, executed in a particularly high quality way or innovated our way out of a mess etc. * Then we do a 5MM Class — Five Minute Master Class. We rotate who on the team has to do it each week: you have five minutes to show everyone on the team something useful int he field of employee communications. Doesn’t need to be epic — heck, show me how to left align a photo in the CMS in three fewer clicks, I don’t care! Just make it useful and do it in fewer than 5 mins. Someone usually video records this and we post it to our wiki/team page. * After that we do “Rearview mirror.” this is where we crack open the spreadsheets and look at whatever data we can regarding the past week’s effort. Which articles were well-read? Which ones had higher conversion to next action (such as watch the video/enroll int he program etc)? Which ones dies on the vine? We have an open discussion about the A/B testing we are doing across some of our channels — the main question is — how do we use data to do better next wk? * Next is “Headlights” where we look ahead. My team got tired of me asking them and having to tell me ad hoc so they created a shared spreadsheet which then led to them moving over to some more sophisticated software. This is where we look at how we are cross marketing our content, load balancing for up-coming doozies and generally thinking through approach and assignments. So far this has been working (we’ve only got about 10 people in this group) but I think I know how to scale it as we get bigger by adding/compressing segments to the weekly team meeting. Also, my initial objectives are starting to be met — I had designed this cadence around a few needs that were particular to building a data-driven employee comms group somewhat from scratch (and by that I mean we had really good people who weren’t necessarily working in the best way possible.) My objectives were to boost coordination, drive content cross-promotion, build esprit de corps, build a culture of comms-enablement (we are already scaling by inviting “non-professional” communicators onto our employee comms platforms) and really, really use data to drive our efforts through frequent contemplation of observable phenomena. That was a really, really long way of saying — if you busted this approach up across your groups within HR you might find yourself not needed the monthly snoozefest. Hope you are doing very well!